BARCELONA, Spain – Freed from fretting about the future, Luis Enrique wants to put a happy ending to his three years in charge at Barcelona. The coach said Friday he was “relieved” to be stepping down after the season, two days after he made the surprising announcement. Luis Enrique insisted that his decision to leave the club was purely personal and denied any tensions within the club or his players. “I need to disconnect,” he said. “I see other coaches who enjoy their profession for years, but that is not my case. It is a personal and private decision. Barcelona striker Luis Suarez said that while surprised by his manager’s choice, he understood. Luis Enrique announced his decision on Wednesday following a 6-1 victory over Sporting Gijon. That, combined with Real Madrid’s 3-3 draw with Las Palmas, left put the defending champions in first place in the Spanish league. 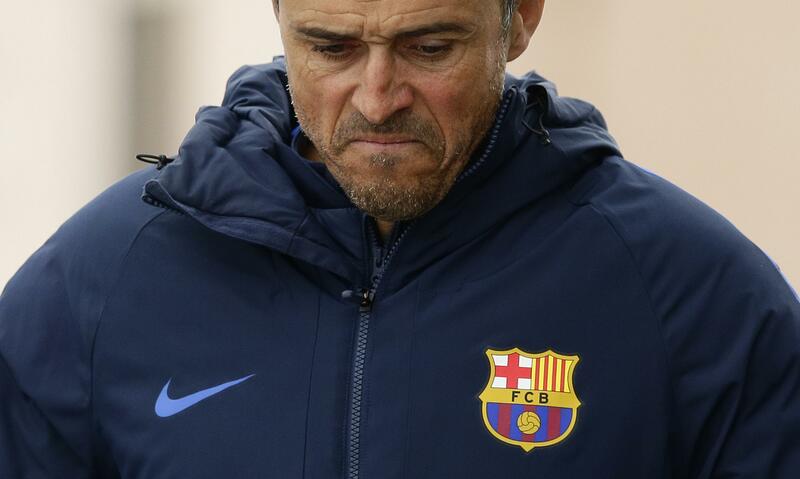 But Luis Enrique has been under increasing pressure because of several subpar performances that culminated in a shocking 4-0 loss at Paris Saint-Germain two weeks ago in the Champions League. His decision to not stay on for a fourth campaign comes a week before Barcelona hosts PSG needing a huge result to avoid its earliest elimination from the European Cup in a decade. First, though, Barcelona hosts Celta Vigo, which Luis Enrique coached before moving to Camp Nou, on Saturday. Celta was the last Spanish league team to beat Barcelona, dealing it a 4-3 defeat in October. Hired after a trophy-less season under Gerardo Martino, Luis Enrique quickly restored the Catalan club to its winning ways with a success rate on par with Pep Guardiola by winning eight of a possible 10 titles. While in the thick of the Spanish league title chase, Luis Enrique will also have chance to win more silverware in May when Barcelona plays the Alaves in the Copa del Rey final. The former Barcelona midfielder said he wasn’t worried about his approaching departure causing a distraction. Published: March 3, 2017, 11:24 a.m.